When new techniques such as Fiori Elements make development as quick and easy as configuration, sometimes the importance of design can be overlooked. Surely if it’s not that hard to do we can just knock up a quick app and the users will be happy? Well no… life doesn’t quite work that way. In the next blog I’ll show you exactly how easy it can be to create a list report… but before we start building I wanted to pause briefly and explain why even list reports need design. If you are not sure what Fiori Elements are, you can find an introduction in my blog Fiori Elements – Why Cookie Cutters Make Me Happy To give you a general idea, here’s a sample of what a Fiori Elements List Report can do on SAPUI5 version 1.40. In my role as a User Experience Strategist I get to see a lot of Fiori implementations – the good, the bad, and the ugly. A curious pattern that emerges repeatedly is that the easiest experiences to develop suffer from the poorest design, even in sites where there is a focus on design led development and human centred design. Typically so far I’ve see this most often when projects fail to design the Fiori Launchpad tile and group organization for their business roles. At a local bank every user saw over 20 tiles on the Launchpad without any groupings. When we talked to users, they typically used only 4-5 tiles, some of the tile descriptions were misleading or appeared to be duplicates, and no-one could make any sense of the tile order. When we spoke to the development team, they admitted that the Launchpad design had been overlooked and tiles had been thrown onto the Launchpad in a rush at the end of the project. End result: bad user experience, lots of complaints, lots of user confusion, high support costs dealing with the complaints and confusion. However that doesn’t mean design needs to be onerous. 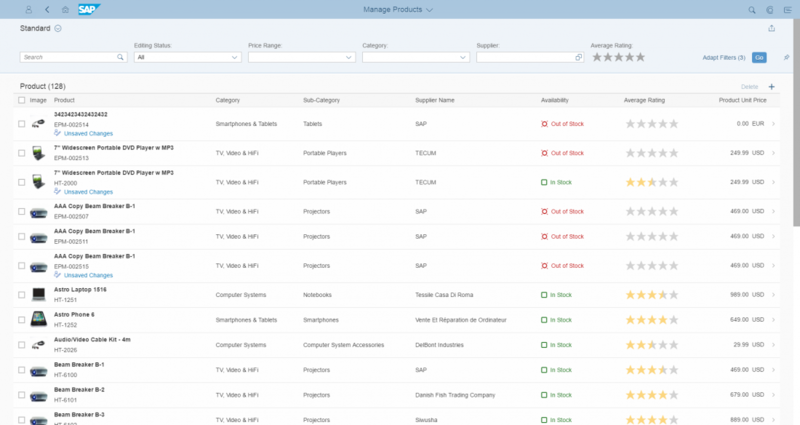 So when it comes to Fiori Elements List Reports here are my top 3 tips for list report design. Ask the question: Is a list report the RIGHT user experience? Is this report genuinely useful to SOMEONE out of the box? Let’s delve into these a little deeper. Of course you’ll also want to know exactly what can and can’t be done in your particular SAPUI5 version with a List Report, and you’ll find that in the Fiori Design Guidelines in the section on Fiori Elements – List Report Floorplan. One of my earliest and most salutary experiences as a young developer was an intense moment of user experience enlightenment. We were moving to a new IT platform and were looking to save current excessive printing costs by removing little used reports from our system. [This was in the days before smartphones, tablets, and at this time PCs were available but not everyone had one or was comfortable with using them.] One of the senior executives was insisting that a particular otherwise very rarely used monthly report be kept. So a colleague and I were sent along to gather requirements and find out what our executive was making such a fuss about. In fear and trembling we entered his impressively large corner office and explained why we were there. He beckoned us over to a large printout over 200 pages long. We could see a small bookmark about a 1/3 of the way into the report. The executive opened the report at the bookmark, pointed to a particular number on the page, and explained that that figure – and only that figure – was what he needed. And then he explained why that figure was important to him. Reflecting on our visit it was clear that a lot of time, effort, and paper was being wasted every month in executing the report, printing it, delivering it to the executive…and all for one figure. Ah ha! The executive didn’t need a list report at all. If we were building that system today, a Smart Business KPI tile would have fitted his use case perfectly. What do you do if a list report is not the right experience? Know your other options such as Smart Business tiles, Analysis Path Framework, and SAPUI5 custom apps. Become the voice of reason by suggesting a more effective way to use company resources and achieve business outcomes. Fiori Elements makes it temptingly easy to include some attractive graphical and interactive elements, such as Rating Stars, Progressive Indicators, MicroCharts, Charts, and other analytics. But that doesn’t mean including lots of graphical elements in the same report makes a report attractive or easier to understand. Don’t make your report look like you stumbled into an amateur painting exhibition …. lots of pictures but nobody’s buying. Too often, in the absence of end user validation, we created user experiences that tried to be everything to everyone. With the benefit of hindsight, we can see that one size fits all approaches result in information overload, lack of user adoption, and consequently loss of desired business outcomes. With Fiori Design the user experience approach is completely turned around. Instead of creating one size fits all, we create tailored apps for specific users in specific business roles. Creating tailored apps is still critical even when using accelerators such as Fiori Elements. The Fiori Element approach lets us reuse the same ABAP CDS view to support multiple use cases. Those use cases still need to be real, they still need to be genuine, and they still need to meet the needs of real end users. Even when you are copying an existing report it’s worth asking your end users how they actually use it. Especially if that report was written with some flexibility built in, such as ABAP List Variants. Often how the report was originally designed is not how it is used today. Things change, business needs change, people figure out workarounds and hacks. Good design for a list report may be as simple as finding out that your users always have to re-sort the report to their preferred order; or that they have set up their own layout to add and remove certain fields; or that they actually run two reports, print them out, then manually cross-reference them. All of these are opportunities to make sure your Fiori Element list report is tailored correctly from the beginning, with helpful sort/filter/group settings, appropriate fields, and useful navigation possibilities. Again the discovery process for your design can be as simple as finding a few users and asking a couple of simple questions such as: “Can you show me how you actually use this report? And how does this report help you do your job?” The answers may surprise you! You may find out that there is actually more than one use case for the same report. That’s ok. Fiori Elements enables us to support multiple use cases. And it’s so quick, that if there is more than one use case, it may just be worth creating more than one list report. What BUSINESS OUTCOME are we trying to achieve with this report? WHO – specifically – will use this report and HOW will they use it? WILL the user be able to achieve that business outcome with THIS report? If you don’t know the business outcome, if you don’t know who’s going to use it, if you can’t imagine how they are going to use it, or whether the report will actually help them achieve that outcome. STOP! And starting asking questions. Above all, remember the Fiori principle of “delightful”. Creating a report that no-one wants or needs is the opposite of delightful – for users it’s just more noise in a noisy world. Fortunately, with UX it’s always ok to start small and scale. Aim to delight at least one user, and then turn that success into a habit. You never know… if any of those users happen to be or become a senior executive, delighting users may quickly become a career enhancing opportunity for you. And at least you’ll have the satisfaction of knowing you have made a positive impact on your users’ experiences. If you want to find out more about design you’ll find a general overview of SAP’s Design Led Development Process in the Fiori Design Guidelines.